Let’s Cry About Pregnancy and Infant Loss Together. When I was in High School, my aunt suffered a miscarriage. I naïvely tried to console her by saying that she had her first born. At the time I did not realize that she was mourning a whole different person. As a teen far too long ago, the youth pastors where I went to church suffered infant loss. I will never forget the small casket holding a baby that I had held just 7 days previous (with far too many plastic tubes attached to a newborn). It was an experience that I never want to relive. October is National Pregnancy and Infant Loss Awareness Month, but most people know about Breast Cancer Awareness. While both are important, most people do not talk about miscarriages or infant loss. So when my husband and I got pregnant after 8 years of infertility, we heard the news that no one wants to hear; “I’m sorry, you can try again.” The truth is that we couldn’t try again. We have been told the odds from our specialist, but the Physician’s Assistant who told us did not know all the information. I wanted to write this at the beginning of the month, not the end. But I just could not express how our loss will never have a new beginning. “When a child loses his parent, they are called an orphan. When a spouse loses her or his partner, they are called a widow or widower. 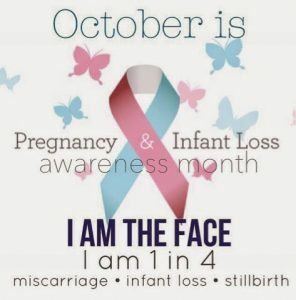 When parents lose their child, there isn’t a word to describe them.” President Ronald Regan said this when he declared October as National Pregnancy and Infant Loss Awareness Month in October 1988. People try to tell me “oh you can just adopt.” Even mothers who have experienced pregnancy say that to me. My own short pregnancy, I felt so much that I will never forget ‒ I didn’t have any tension headaches, I craved mint chocolate, I felt a strong sense that the names that my husband and I picked out were not what this baby had in mind. Now going into our 40’s, we know our chance of becoming parents is pretty slim. You share watching kids grow up, seeing your beloved’s eyes merged with your grandmother’s personality. Things that you will never see with adoption ‒ feeling your baby kick and hiccup inside you, feeling that baby move closer to your spouse when it hears their voice. We are mourning the loss of a family. So many of our friends have kids and are going through a divorce. These friends are mourning the loss of their family, but life will go on for them. We will have no one as we age. Even in my large family; parents, children, and grandparents are exclusive. I constantly worry about being an “Elder Orphan,” (but more about that later). So much we have picked out will go to waste like a 4 slice toaster that we purchased with the dream that kids would be using now. Being economical all 11 years of our marriage, he and I have never had a Christmas tree. Why would we? No one comes over to our home for Christmas. Do I sound bitter? I am. I was just “childless shamed” last week at the gym. Someone said they saw me too much and that it must be because I don’t have kids. I would adore staying home with my children and teaching them the recipes my great grandmothers taught me! Most the time I go to the gym as retribution to my body for betraying me and my husband so badly. Pregnancy and Infant Loss is a topic that we need to be more open about in our society. It is heartbreaking. If we can be empathetic and compassionate instead of being passive about it hopefully, just hopefully, those who have suffered this type of loss can begin to heal and open up to their options instead of feeling bitter about how society treats us. One day, after a lot of healing, I’ll be comfortable to adopt. Until then, please talk about infant and pregnancy loss. A small “I’m here if you need someone to cry with” is all someone may need. And by all means, ask us for help with your kids. We love spending time with them. The best I feel when someone does see those positive pink lines and they think of telling me personally. Not over social media but a call, message or text. It lets me know that they were thinking of me. I know that I mean something to them and they did not want to hurt my feelings and wanted to include me in their joy. I cry every time! But they are tears of sorrow and joy.